. This shield can interface with up to two NXT motors as well as the ultrasonic rangefinder. In addition to controlling motor speeds via pulse-width modulation, the shield reads the motor’s encoders so that it knows the position of the motor with a precision of 1 degree. The NXT Motor Shield is discussed in the TJK Electronics Blog. 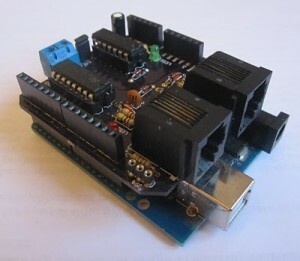 The NXT Motor Shield kit can be purchased at the TJK Electronics Store. LEGO Mindstorms, one of the best robotics kits, is about to get even better! 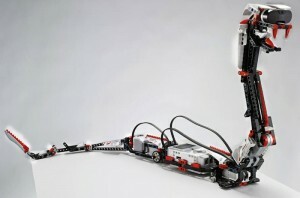 Earlier this month LEGO unveiled the new LEGO Mindstorms EV3 at the Consumer Electronics Show (CES), in Las Vegas. As technology becomes more a part of us, LEGO Mindstorms is evolving to provide us greater connectivity to our creations. Like its predecessors, LEGO Mindstorms EV3 will four motors and five sensors including a new infrared sensor that will enable the robot to track a remote control. The expanded brick employs an ARM 9 central processor that can access 64 MB of RAM and 16 MB of Flash. This results in more room for stored programs. The brick also comes equipped with an SD-slot that allows one to expand the memory further. With a new secure Bluetooth chip, the LEGO brick can now connect to the Android and iOS operating systems so that one can use a smart phone, an iPhone or an iPad to control the robot! There will also be a USB port that will allow connectivity via WiFi. This increase in connectivity will open up a world of new possibilities. Hackers will be happy to hear that the operating system is a version of Linux for which LEGO will release detailed documentation as well as an SDK. LEGO will release the Mindstorms EV3 to the public this summer. The Knuth Cyberphysics Laboratory focuses on studying the fundamental physics governing the processes of information-driven systems. At present we are focused on two research projects. The first, which is funded by a NASA SBIR grant, aims to develop Bayesian vision-based navigation systems for future NASA missions. The second, which has been funded by NASA in the past, is focused on developing intelligent instrumentation in the forms of science platforms that can autonomously decide on and perform their own experiments. Both projects, which are focused mainly machine learning software, rely on robotic platforms that we construct out of LEGOs. LEGO bricks are prefabricated plastic parts that can be assembled and disassembled in a matter of hours. We have found them to be quite versatile and capable, as well as being inexpensive. World Network (Japan Broadcasting Corp.). They were working on a piece focused on the Mars Curiosity rover and were interested how NASA missions fostered creativity in robotics. 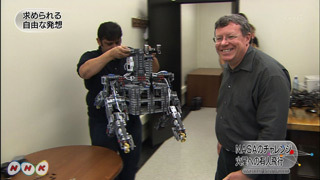 In our lab, they were specifically interested in the fact that we used LEGO robots to test software for funded NASA projects. The program aired in Japan on Sept 15, 2012. Here is a link to the show’s website. Incorporating a unique way for free thinkers NASA challenge space development. How is block have become toys. Share the anticipated blueprint image team studies the next-generation spacecraft, while using the block and identify the problem. Easily can be recreated many times, easy and free thinking-is an advantage of the block. Using the block curiosity Inc. developed and went on. Research and development professionals “using blocks, a good idea? so readily detect if it isn’t policy change even faster” and speak. In celebration of the landing of the Mars Science Laboratory, Curiosity, on Mars, Doug Moran and Will Gorman of BattleBricks.com built a LEGO MINDSTORMS model of the Mars Curiosity Rover. 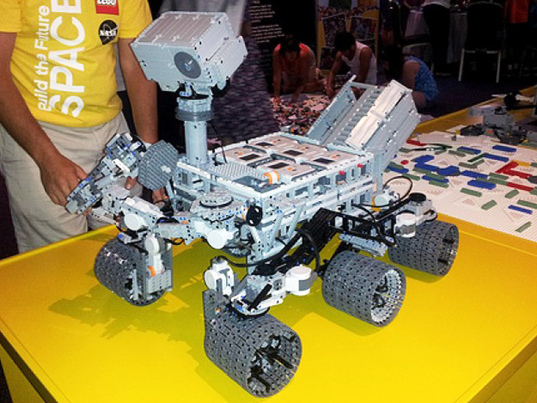 The model was part of the Build the Future in Space event at NASA’s Kennedy Space Center. 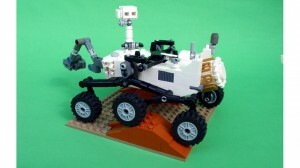 The LEGO Curiosity Rover relies on 7 NXT Bricks running leJOS NXT. It employs 13 NXT Motors, two Power Function Motors, and 1000+ LEGO Bricks. Here is a video of the rover in action! 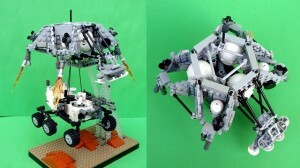 Check out LEGOSpace.com to learn more about the long-awaited NASA-LEGO partnership. And be sure to check out what the real Curiosity Rover is experiencing on Mars! Stephen Pakbaz, a mechanical engineer at NASA’s Jet Propulsion Laboratory (JPL) who actually worked on the Mars Science Laboratory (MSL), also known as NASA’s Curiosity Rover has built a small LEGO model for others to build and enjoy! This model features an offset differential suspension system that works so well on Mars, and this video on Flickr shows that it works well during play as well! This model comes with free pdf instructions (download here) and a LEGO Digital Designer Model (download here). One can also build the descent stage and sky crane pictured below! 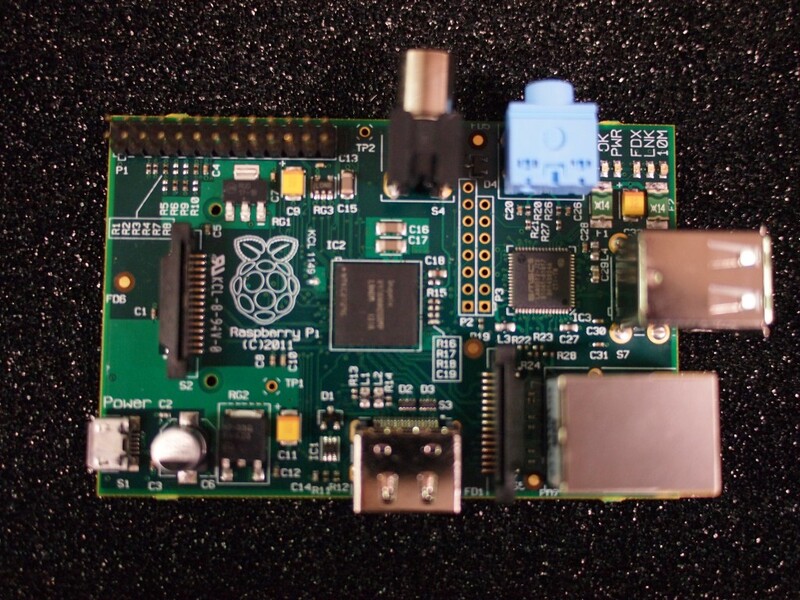 Here comes Raspberry Pi, and it is going to change the face of robotics forever! 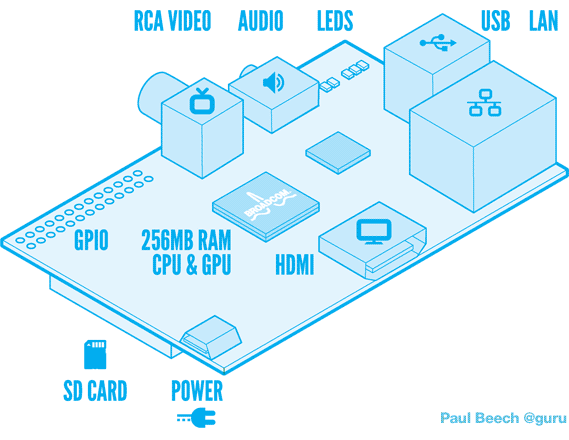 Raspberry Pi is Linux machine the size of a credit card. Plug in your television and a keyboard and you have a fully-functional computer for $25. There are two models, Model A and Model B. Model A has 256MB RAM, 1 USB port and no Ethernet (network connection). Model B has 256MB RAM, 2 USB ports and an Ethernet port. It relies on a System on a Chip (SoC). The particular SoC used is Broadcom BCM2835. The Broadcom BNC2835 is a High Definition 1080p Embedded Multimedia Applications Processor. It relies on the ARM1176 (ARM1176JZF-S) Processor which has a floating point processor and runs at 700 MHz. Moreover, the SoC has a Videocore 4 GPU, which is capable of BluRay quality playback, using H.264 at 40MBits/s. The Broadcom BNC2835 has a fast 3D core accessed using the supplied OpenGL ES2.0 and OpenVG libraries. The GPU is capable of 1 Gpixel/s, 1.5 Gtexel/s or 24 GFLOPs of general purpose computing. The Raspberry Pi is SMALL! The card is slightly larger than 85.60 mm x 53.98 mm x 17 mm due to the fact that the SD card and connectors project over the edges. It weighs with a mass of 45g. The Raspberry Pi is low power and runs on 4 AA cells. Fedora, Debian and ArchLinux are supported and other distributions will be supported later. Python is the official educational language. I cant wait to get my hands on one of these and begin interfacing directly with the LEGO motors and sensors!